I’m back home in the mountains for a few days and the best part is that there’s snow here! I’m one of those people who like the cold (as long as it’s snowing!). 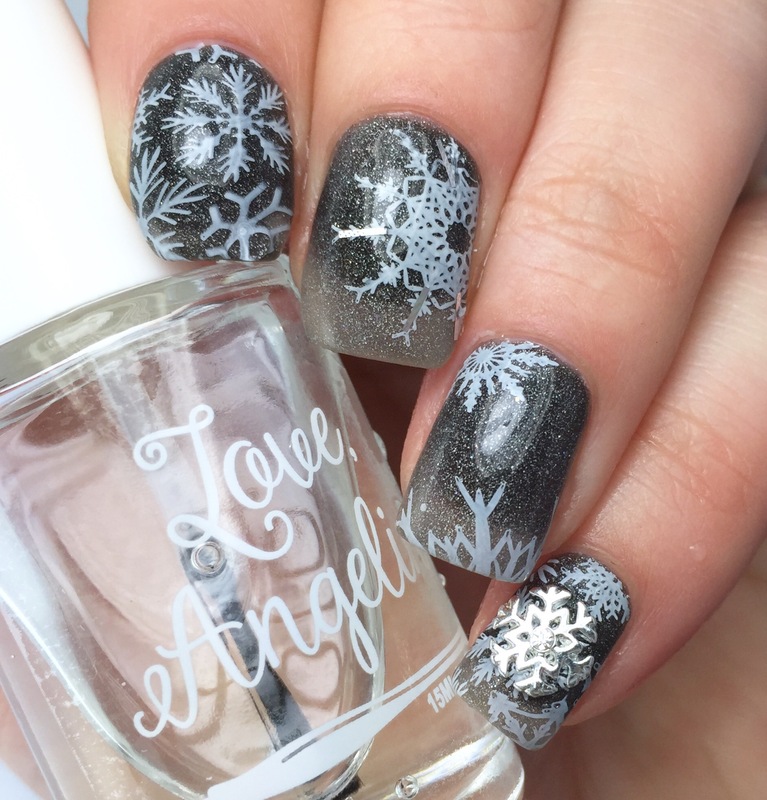 With Christmas looming, I was inspired by the snow and the song “Silent Night” to do this manicure. 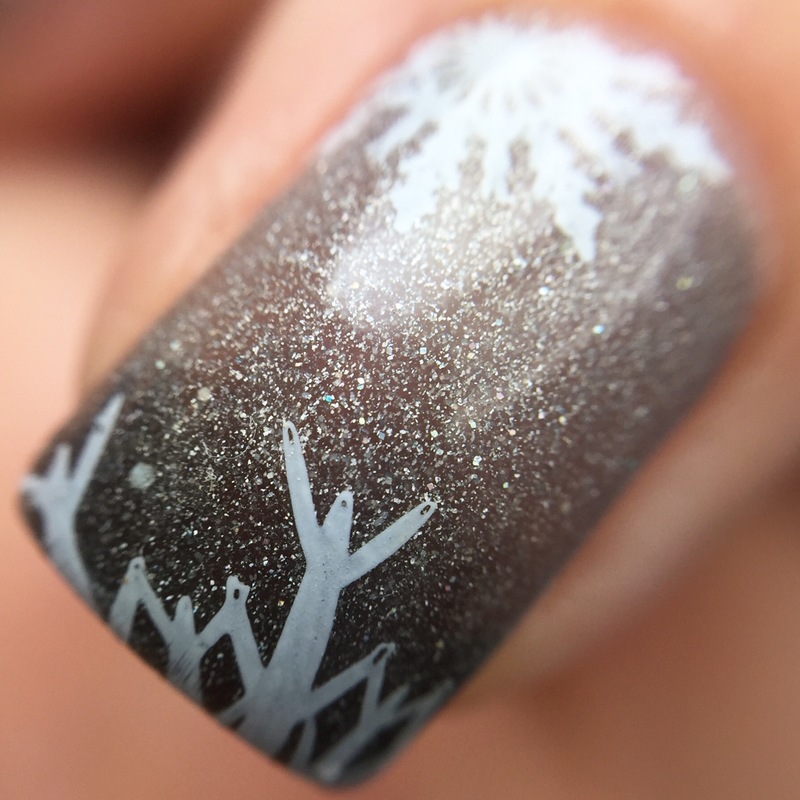 For the base, I used The Lady Varnishes “Don’t get Afraid, Get Angry,” a gray-to-black holo glitter thermal. (Also mine is scented like vanilla. Swoon.) 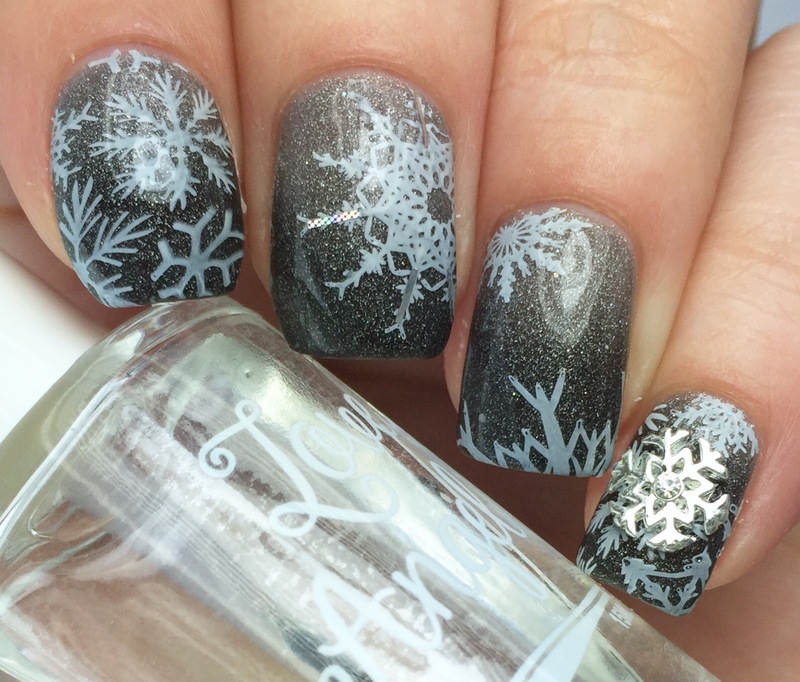 Over that I used the Uber Chic Christmas plate to stamp a variety of snowflakes on my nails and then added so bar glitter to emphasize the icy flakiness. 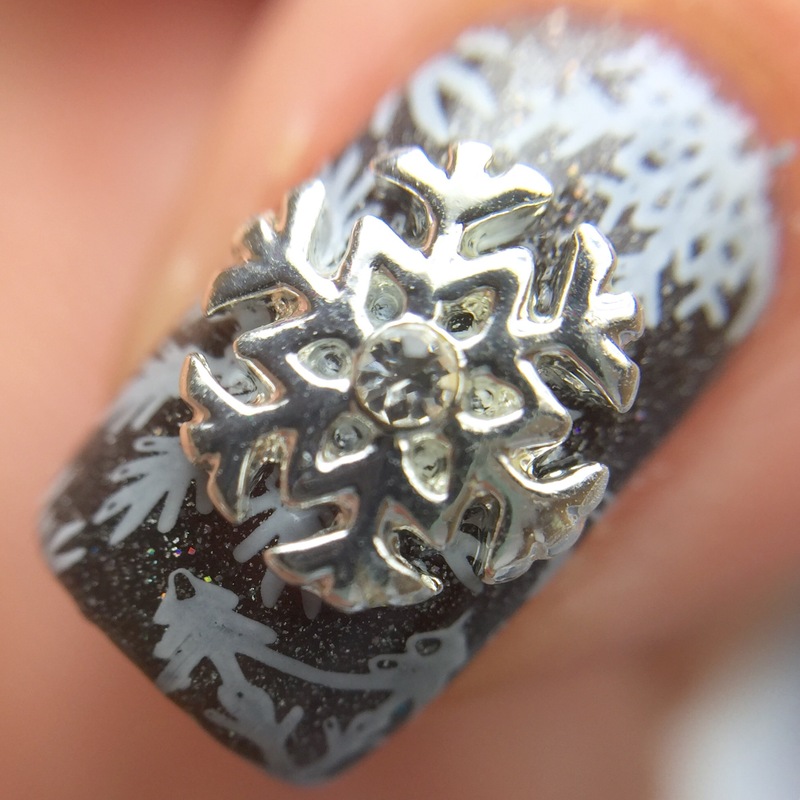 I also added a snowflake charm from Daily Charme to spice things up! The real champion of this mani is Love, Angeline’s new top coat “Topped with Love.” I received this polish to review and am really glad that I did. I am terrible at change. Left to my own devices, I will use the same top coat/take the same route to work/eat the same thing for dinner every single day from now until the heat death of the universe. When it comes to change, there are continents moving faster than me. I have been using the same top coat for years. Until now. Having received this a week ago, I have already used it in over a dozen manis and have purchased a backup bottle. I just feel like everyone needs to know whata momentous occasion this is. I changed my habits! 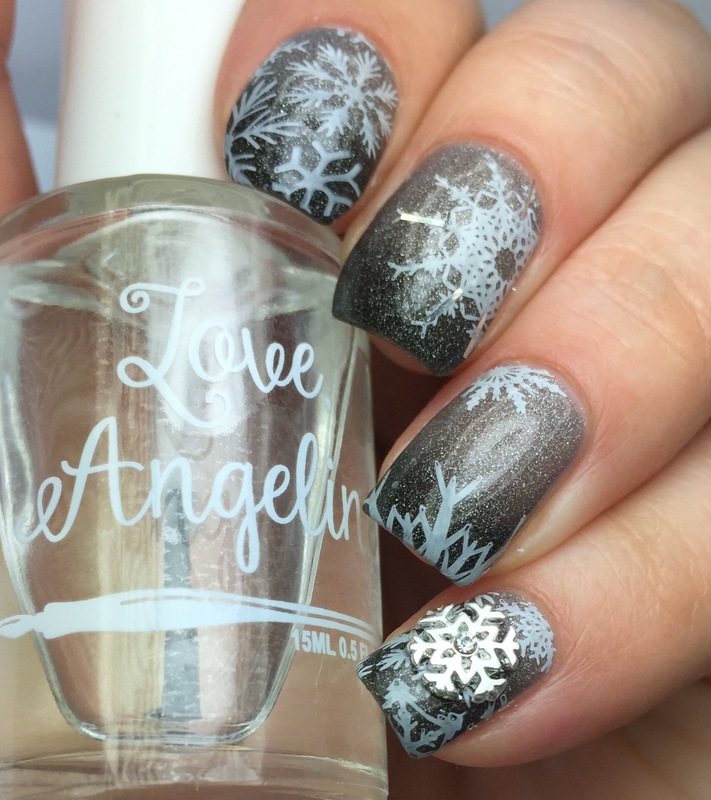 I’ve been using “Topped with Love” for all of my holiday nail art over the last month, and I’m really happy with how it does. I stamp frequently (and I did in this mani), so it is important that the top coat doesn’t smear my handiwork. I especially like how smooth this top coat is, without being bulky. For this nail art, I’m wearing three coats of the thermal, a coat of “Topped with Love,” a layer of stamping, and then another of top coat, and it doesn’t feel thick at all. As for wear time, I’ve been using this for every mani since the beginning of December, and I’ve really noticed that it lasts well on me- it stays shiny, chip-free, and unshrunken for the 3-6 days that I normally wear a manicure. My previous holy grail top coat could hang on for that long, but I’m really impressed that “Topped with Love” stays shiny and doesn’t get all dull and scratched after a day or two. The other major difference I notice with “Topped with Love” is that it doesn’t have the strong smell that my previous top coat had. I’m pretty sensitive to smells, so I’m super happy to have a top coat that is easier on my nose (and my watery eyes). 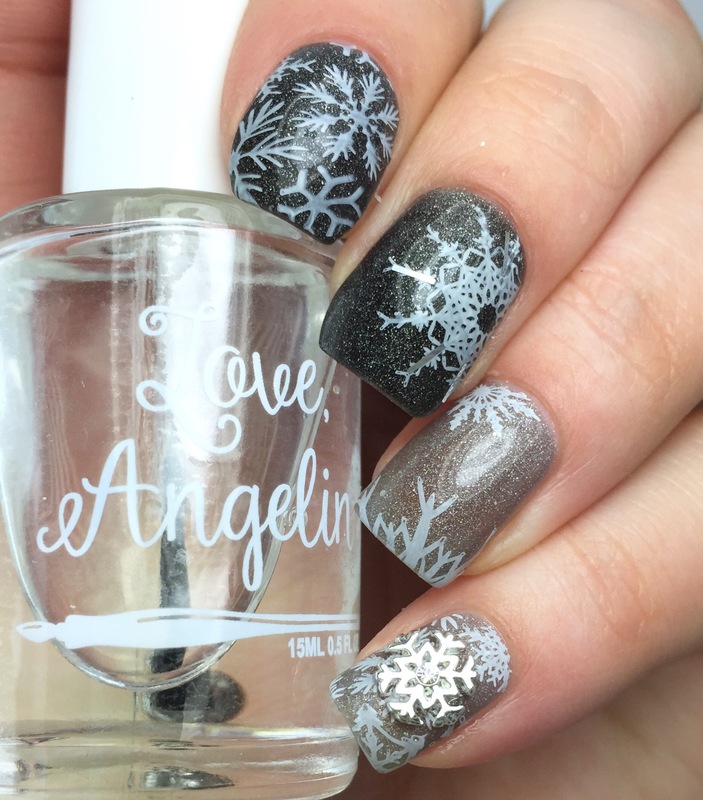 The moral of the story here is that Love, Angeline makes one mean top coat. I love it, and I’ve already snapped up another bottle (and I’m hoping they come out with a larger size soon!). The extra great news is that “Topped with Love” is on sale for just $5! Your manicure came out beautiful! The snowflake charm adds a nice touch. I just did a simple accent nail look for Christmas. I used Cover Girl Inferno nail polish on four of of my fingers, then on the ring finger I did OPI Golden Rules! topped with Revlon Spiderman Collection nail polish in 1000 volts. So it’s a red/gold theme.